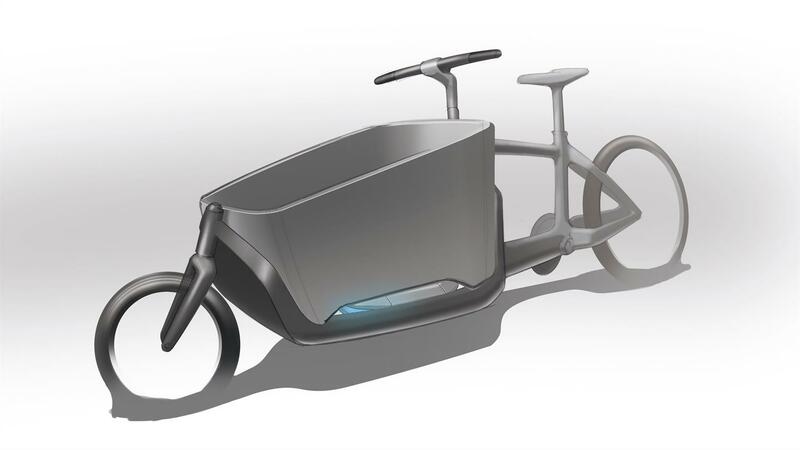 Visualization of the cargo bicycle with the Fuel Cell Power Pack (FCPP) (at the left, under the steering control). Power for sustainable mobility – Fuel Cell Power Pack (FCPP). 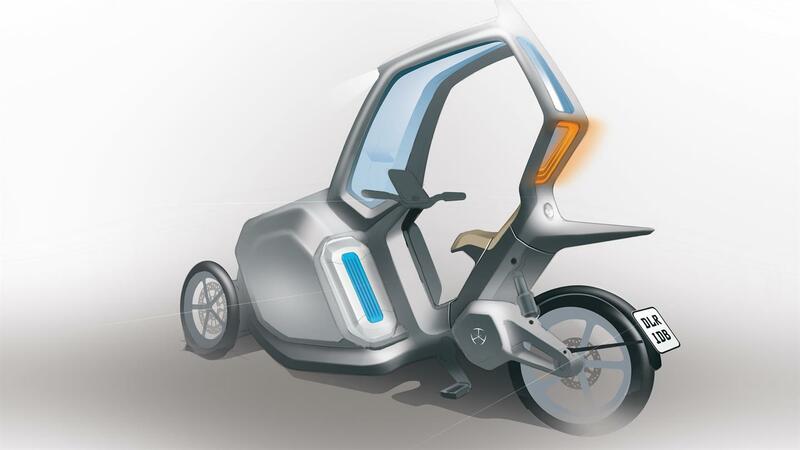 The fuel cell concept can be flexibly adapted to suit various wheel configurations. In this variant, the Fuel Cell Power Pack (FCPP) is under the cargo area. 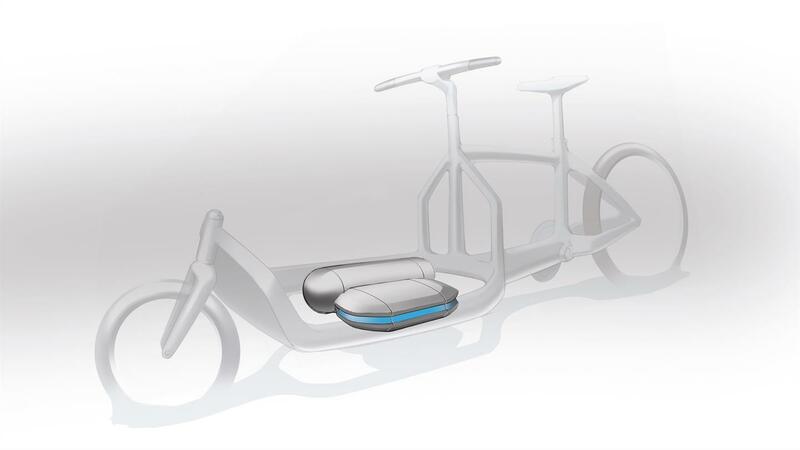 With its Fuel Cell Power Pack (FCPP), the German Aerospace Center (Deutsches Zentrum für Luft- und Raumfahrt; DLR) has developed an innovative fuel cell module that makes cargo bikes ready for everyday commercial use, extending their range and doubling the service life at a comparable price to purely battery-operated systems. DLR researchers are organising a spin-off project to deploy the technology alongside an innovative logistics concept that is faster and more flexible than a car or van, while also ensuring quiet and emissions-free operation. The DLR spin-off project FCPP is one of the six innovative business ideas selected in the current competition round for the Helmholtz Enterprise support programme organised by the Helmholtz Association of German Research Centres. The scientists' concept is based on a hybrid drive system: the Fuel Cell Power Pack combines a fuel cell with a small lithium-ion battery. 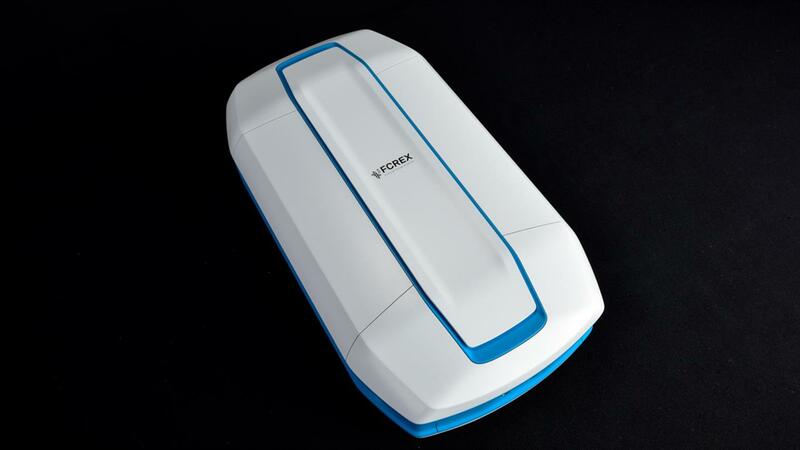 The fuel cell is designed for a continuous output of 300 to 500 watts and can charge the battery – which is activated in peak load periods, for instance when accelerating – while travelling or during breaks. "Our system can be filled up in seconds and works reliably, even at low temperatures," says Mathias Schulze from the DLR Institute of Engineering Thermodynamics in Stuttgart to summarise two of the key benefits of the Fuel Cell Power Pack, compared to exclusively battery-operated systems. The bicycle can be operated all day in several shifts without requiring the time-consuming charging or replacement of the battery, as the hydrogen tank only takes seconds to fill. Also developed by DLR, an innovative cold-start module enables reliable winter operation. It works on the basis of metal hybrids that preheat the fuel cell system without extracting energy, which would otherwise reduce the range. The modular structure of the Fuel Cell Power Pack means it can be easily integrated in current bicycle concepts. "The application focuses on what is known as the last mile, so the distance between the distribution centre and the customer's address. This route is becoming increasingly important due to the spiralling volumes in online retail that require faster delivery of smaller consignments to decentralised recipients," says Christian Rudolph from the DLR Institute of Transport Research in Berlin. Commercial transportation accounts for up to 50 percent of the road traffic emissions in European cities. Research conducted at DLR indicates that electric cargo bicycles can be used for half of all document and parcel consignments on the last mile. "Current concepts do not satisfy the requirements of the logistics industry in regard to range, service life and winter operations. We believe that our approach delivers a unique selling proposition in these areas," adds Rudolph. Spin-offs from research are an important way to harness research results and new technologies and make these available for society. Among other things, the Helmholtz Association supports founders of science with the 'Helmholtz Enterprise' programme, with two of the six companies being promoted coming from DLR this year. The DLR spin-off 'neoficient' will also be part of the Fuel Cell Power Pack at the DLR Institute for Solar Research. The spin-off offers a fast energy analysis of buildings and apartments. The measurement with a newly developed infrared (IR) interior scanner is so simple that it can also be performed by laypersons. In a virtual room model, visual and IR data are then combined. Thus, among other things, the heat transfer coefficient, thermal bridges and moisture can be displayed very quickly. The spin-off projects now have up to 260,000 euro available for one year.